First, there’s the Magenta kernel based on the ‘LittleKernel’ project. Just like with Linux and Android, the Magenta kernel powers the larger Fuchsia operating system. Magenta is being designed as a competitor to commercial embedded OSes, such as FreeRTOS or ThreadX. However, Magenta is designed to scale much better, enabling Magenta to work on embedded devices, smartphones, and desktop computers. For this to happen, Magenta improves upon its LittleKernel base by adding first class user-mode support (a necessity for user accounts) and a capability-based security model (which would enable something like Android 6.0’s permissions to work). But that’s just the kernel; what about the rest of the OS? It looks like Google is using Flutter for the user interface, as well as Dart as the primary programming language. The icing on the cake is Escher, a renderer that supports light diffusion, soft shadows, and other visual effects, with OpenGL or Vulkan under the hood. Shadows and subtle color reflections are a key component of Material Design, so it seems Flutter and Escher could be designed for the Material Design UI in mind. We know it has support for both 32-bit and 64-bit ARM CPUs, as well as 64-bit PCs. If you have the technical prowess, you can even compile it yourself and run it on a real PC or a virtual machine. Travis Geiselbrecht from Google also confirmed it will soon be available for the Raspberry Pi 3. So, why? Why is Google quietly developing a brand new OS and kernel, with support for smartphones and PCs, possibly built with Material Design in mind? 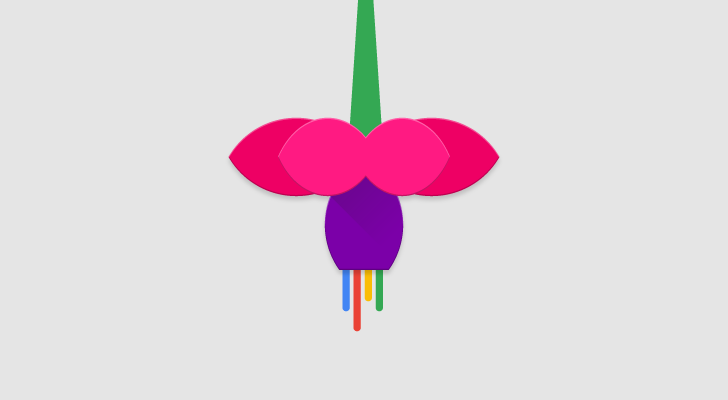 The most obvious guess, and the most exciting, is that Google hopes to one day replace Chrome OS and Android with Fuchsia. But perhaps Google will treat Fuchsia like Samsung treats Tizen OS; a lightweight OS used on hardware not suited for full-blown Android. Google’s collection of embedded hardware, such as the OnHub router and Google Home, is growing. Perhaps Fuchsia is only being developed for devices like these? But there is always the possibility that this is simply a Google experiment, and may never see the light of day in a commercial product. Developing an entire kernel and operating system is a massive task, and Google currently seems content to continue using Android, Chrome OS, and their derivatives for their hardware offerings.